A pendulum design incorporating ball bearing based pivots. 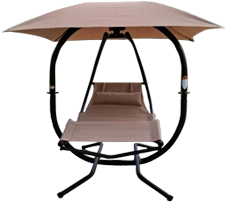 This provides a very smooth rocking motion for enjoyable rest and relaxation. These swings are one of a kind, starting from the quietness when in motion to the smoothness of the long lasting rocking. Your Backyard, the place to be! Total Comfort Swings are unique, high quality, movement based swings that the whole family can enjoy! Total Comfort Swings are unique, high quality, movement based swings that the whole family can enjoy! 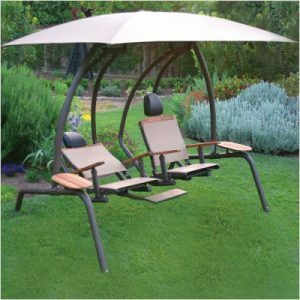 These swings are one of a kind, starting from the quietness when in motion to the smoothness of the long lasting rocking. 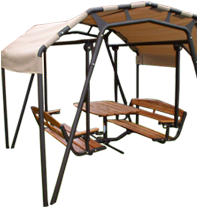 From the 4 models we offer, you will be sure to find a swing to suit your surroundings. 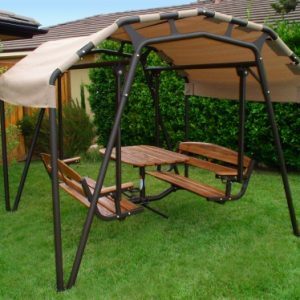 Total Comfort Swings is a division of Sunset Swings a specialty Marketing company that promotes and distributes well designed, developed and manufactured premium quality outdoor equipment and patio swings. "Great Place To Sit & Chat With My Friends"
I received a bench swing as a Christmas present this past year and I wanted to say that I absolutely love the swing. I have enjoyed it, find it a great place to sit and chat with my friends, lounge in the sun or read a book under the shade of a tree. My swing is totally in the elements in Florida and it has held up tremendously well. The wood on the swing looks as new as the day I got it. The Frame is in excellent shape with no indication that it has been in all kinds of weather including hurricane weather! I love the smooth motion of the swing. It does not creak or moan like other swings that I have had in the past. The bench of the swing is very comfortable and supportive of the back. I also want to thank you for your timely manner of shipping the swing from California to Florida. The swing when it got here had all that I needed to assemble it and assembly was very easy. I have many friends who are going to buy a swing for themselves. Keep up the good work! We purchased this swing several years ago, before it had the bracket to adjust the canopy. We've retrofitted the bracket to our model, and the result is near perfection! We relax here all the time and it's been a huge hit with our friends and neighbors when they come over to our house. I can't count the number of evenings I've come home and decompressed lazing in this swing. I often have to displace our cat, who loves to sit in it during the day, and my dog loves to lay in it with me while it gently swings. Much better than other chairs or a hammock...We've tried them all. The only quibble I have (and why I rate this a 4 and not a 5) is the need to watch small children when they're in the back yard. Our experience is that they love to sit in the swing, but tend swarm around the chair, waiting their turn. I've had a few knocked over when the get in the swing radius. Not a deal breaker - but be aware. The "chair" itself is heavy, and no one should run in front of it when it's in motion. We have had our 420 swing for approximately 2 years. It has been the highlight of our summer ever since we got it. When we sit in it, we always have friends and family stop by to chat. 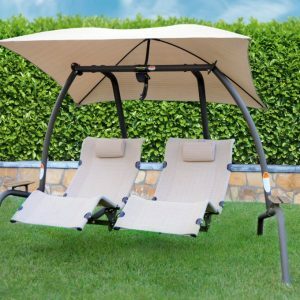 We love the adjustable canopy. It’s nice to be able to sit in the shade of the canopy regardless of where the sun is. We also like the adjustable seats and foot rests. It gives us the choice to sit back and relax, or to sit up and entertain guests. We are thrilled with the durability of the materials that make up the swing and withstand the harsh climate changes of the Midwest. Our friends also love our swing, and just sitting in it has encouraged some of them to buy their own. I bought this swing about 4 years ago (maybe 5) and we LOVE it. We didn't use our backyard much before this swing. Now we sit outside every summer evening chatting about our day with a glass of wine. Like a little vacation. It is sturdy, comfortable and peaceful. The materials stand the test of time. We saw a bit of rust and the customer service is amazing. The new part was here before I could imagine. More companies need customer service like this one. We are a combined weight of about 400lbs and we fit with plenty of room for our little one. Perfectly balanced backyard swing put together by my wife and myself in a few hours with a few breaks. Came with the best layout of hardware in step by step fashion that I've ever seen. Solid material, very strong, is going to last and ride through some weather down here in south Florida without difficulty, I think. I have nothing negative to say. Came in two big boxes. My wife can't get our daughter out of it but since it's so nice and wide, she doesn't have to. She just climbs in and swings with her. When we first saw the number of pieces in the package it was a little daunting, however, the assembly instructions are the best we have used in a long time. Our 8 year old helped us with most of the assembly, some pieces are too heavy and/or high for him. We truly enjoy sitting outside in this chair and it has been money well spent. The chair is very stable and comfortable we are looking forward to many years of use. A pendulum design incorporating ball bearing based pivots. This provides a very smooth rocking motion. Breathable PVC fabric used to create both the seat and the canopy. With a UV resistance of 80% this material will last for some time. The frames are made from 11-gauge, 3” round steel. A powder-coated finish has been applied. Each swing comes with a 10-Year limited warranty. There Is No Wrong Place For Your Swing! You may find yourself wondering where in the world a swing such as this may be placed for best effect. The wonderful thing is that there is no truly wrong place. No matter where you place it there is one thing of which you can be sure. 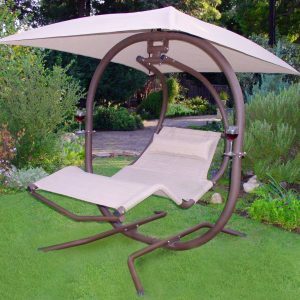 Your new Total Comfort Swing will offer you a wonderful place to relax or even nap and do so in style. Fill out the form below to request more information from Total Comfort Swings! Sale: Free Swing Cover with purchase of 421L or 422SB Swings! Up to a 285$ Value!